Lots of companies want to do more supply chain collaboration, - but how? Members of the Georgia Tech Supply Chain Executive Forum were recently treated to an outstanding presentation on the topic from Nick LaHowchic, former executive vice president of The Limited Brands and president of Limited Logistics Services. 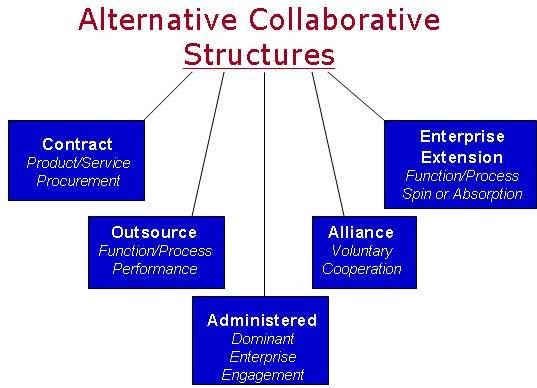 The illustration below provides a framework for the various types of collaborative relationships or structures a company can consider with its supply chain partners. The model can help companies think about their portfolios of trading partners, and what structures are most appropriate for each, although LaHowchic made clear it is simply not worth collaborating with many trading partners.